Once I got a project of converting PHP project to JAVA project. I don't have any experience with PHP. I tried to run PHP and Java on single server but I couldn't setup well. Then I just got an Idea of Proxy Servlet and I built one Proxy Servlet to forward requests to another server. In this article I will explain how I did this. PHP project version is running in remote server. 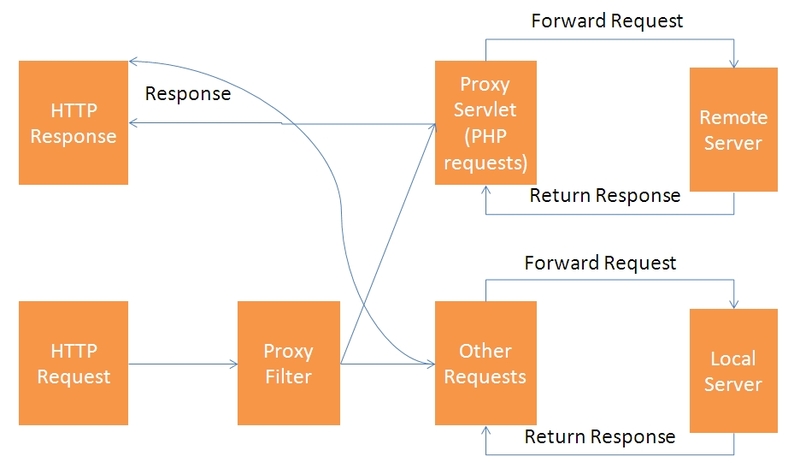 Here Proxy Servlet forward the PHP requests to remote server. Where would be the entry of the ProxyServlet is made...is it either on the client or on the Remote Server?